The following is valid for OpenWRT Release 18.06. Earlier OpenWRT or LEDE versions used a different approach. 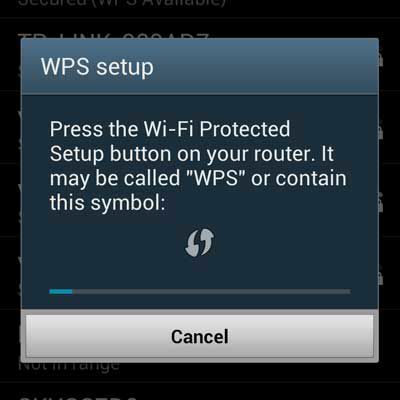 The WPS button is used to connect a wireless device or computer to your wireless network by WPS without the need to manually select the wireless network and enter a password. This is not enabled on OpenWRT by default and additional software and configuration is needed to make it work. Your workstation needs to have a wired Ethernet connection to the router, as Wi-Fi will be temporarily turned off during the next steps. A full reboot is needed to activate these changes. The LED below the WPS button should start to blink in amber indicating that the router is ready to add a wireless device or computer by WPS. Initiate a WPS registration on a WPS capable device by pushing its WPS button. Android devices can do this in their Wi-Fi settings page. Select Advanced in the top right menu of the page with the list of all nearby wireless networks. Then choose the WPS Push Button option in the list. According to the device manufacturers manual, with its original firmware the WPS LED stays solid green when wireless security is enabled in the router. We haven’t implemented this. The WPS LED normally stays off.